The model CTH7000 hand-held thermometer is a high performance 2-channel thermometer for Pt100 and thermistor probes. The hand-held thermometer CTH7000 is a step up in measurement accuracy with a battery power. 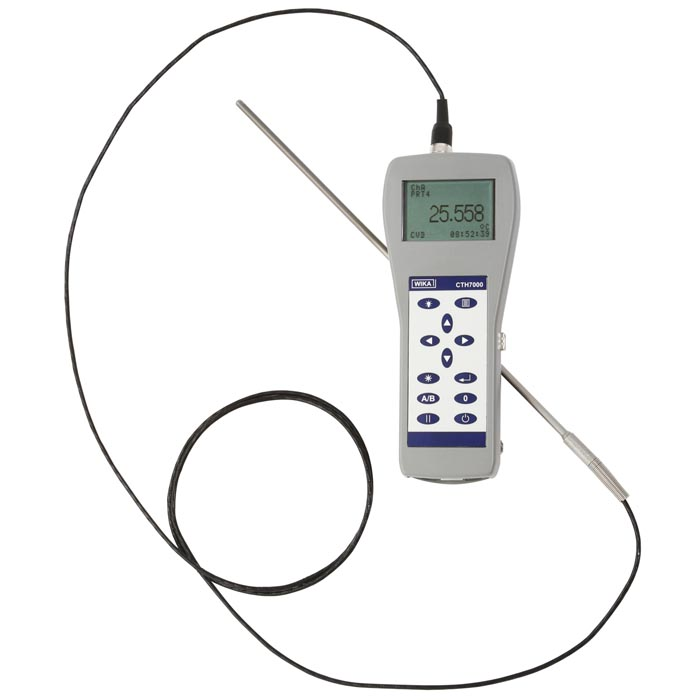 The CTH7000 can handle all needs, with accuracies and resolutions normally associated with a bench top thermometer. Two inputs give direct temperatures from Pt100 or thermistor probes or can display the temperature difference between them. Measurements can be logged directly to memory or, use the USB port to control and data log with the PC. The CTH7000 will display a statistical analysis of measurements, with average value, min and max values and standard deviation. Because the CTH7000 will display in ohms as well as temperature, it can even be used to calibrate one probe against another. Most instruments require to enter calibrated probe data into memory to optimise measurement accuracy, which can mean a lot of data entering if you change probes regularly. With ASL's SMART connector on the probes, you only need to store the data once - in the connector! The calibration data stays with the probe - permanently. The probe can even be used on another CTH7000 without any further action. The SMART connector saves time and reduces error. If you have existing calibrated or uncalibrated probes, no problem, CTH7000 automatically registers if a probe is SMART or normal.